What’s it called you ask? It’s called “Discover it,” and essentially replaces the existing Discover More card. The new Discover it card was born out of customer service and loyalty, so you can be assured that there are plenty of frills with this puppy. First off, just like the Discover More card (and the Chase Freedom card), you can earn up to 5% cash back in select rewards categories that rotate, such as gas, restaurants, movies, and more. The categories rotate every three months, but they seem to get a lot of repeats perhaps due to their popularity. I believe Amazon is now a sure thing every fourth quarter to coincide with holiday shopping. They include all types of stuff like 5% cash back at gas stations and ground transportation, 5% back on all Amazon purchases, 5% back on groceries, and much more. However, you are limited to up to $1,500 in purchases per quarter, which comes out to $75 max cash back every three months. So you won’t get rich here. You also get unlimited 1% cash back on all other purchases made with the it card. And be sure to browse through the Discover Extras Offers to find even more discounts (can be accessed on the mobile app or website). Additionally, and this is a biggie, the Discover it card gains you access to the ShopDiscover shopping portal, which offers 5% cash back on top of the cash back you earn via the rotating categories at a ton of popular stores. This is a great way to stack your rewards and get 10% cash back or more with ease. For example, one of the rotating categories offers 5% cash back at Bed, Bath, and Beyond. If you shop via the ShopDiscover portal, you double that to 10%. It’s that easy. You can also earn 5% cash back at places like Best Buy, the Gap, Hotels.com, Macy’s (10% cash back), Nordstrom (10% cash back), Petco (10% cash back), Staples, Starbucks, and many, many more. As far as redemption, you can apply the cash back as a statement credit, buy gift cards, or use the money to shop at Amazon.com. So it’s a snap to get your cash. While it’s not advisable to ever pay late or miss a credit card payment, it’s nice to know that “it” has your back in this regard. On top of that, they won’t increase your APR if you pay late, so you don’t have to worry about costly default APR if you make a mistake. You can even pick your own specific credit card payment due date, and pay online or by phone until midnight EST with no fee. If that’s not enough for you, Discover it also protects those who might lose their jobs. Assuming you become unemployed, Discover will lower your interest rate and/or your payment, or figure out another way to “help” you get back on your feet. Oh, and they’ll do it all from within the United States because their customer service department is 100% U.S. based. That means Discover will make it easy to discuss anything related to your card, instead of forcing you to deal with foreign reps that are difficult to communicate with. They’ve even got a one-on-one “Cashback Concierge” who can you discuss your rewards options with you to help you get the most out of them. Along with all the aforementioned perks comes a promotional 0% APR , which varies depending on the Discover it card you choose. If you go with the standard Discover it card, you get 0% APR for a full 14 months on both purchases and balance transfers. After that, the APR rises to a variable interest rate based on your credit score. If you have existing (non-Discover) credit card debt you want to move to the Discover it card, they also have an option specifically geared toward credit card balance transfers. This version gives you 0% APR for a full 18 months on balance transfers, but just six months of 0% APR on purchases. After that, the credit card APR rises to a variable rate. There is a 3% balance transfer fee with this offer, so you may want to consider the Slate No Fee Balance Transfer offer instead if you need to transfer an existing (non-Chase) credit card balance. If you’re a student, Discover it also has you covered, though the terms aren’t as good. Of course, beggars can’t be choosers, especially if you’re a student with limited credit history. This version of Discover it offers 0% APR for six months on purchases, and 10.99% introductory APR on balance transfers for six months. I’m assuming they don’t expect students to already be in debt, which is why the balance transfer APR is so high. After the promotional period, the credit card APR rises to a variable rate. Assuming you’re interested in any of the Discover it offers, the card will be delivered to you in expeditious fashion. That’s another one of Discover’s moves to boost customer satisfaction. 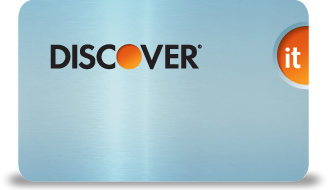 All in all, the new Discover it card looks like a winner, other than its somewhat ambiguous and confusing name. But it is very clear that Discover launched this card to compete with the likes of Chase and American Express in the customer service department. Sure, there are better cash back options, such as the American Express Blue Cash card, but this is a good all-around credit card for the many reasons listed above. I have this card in my wallet mainly for the 5% cash back rotating categories. The best one being the online shopping that is typically featured during the fourth quarter each year. It’s a simple way to earn $75 with very little work (5% of $1,500 max). Additionally, the ShopDiscover portal is an awesome way to earn even more than 5% cash back with little effort at a ton of different online merchants. To be honest, I don’t use this card that often, but when the 5% cash back categories come along, I’m all over it. The free FICO score doesn’t hurt either, and the lack of an annual fee allows me to keep it around without any real drawbacks. Bonus: The Discover it card now comes with a free, updated FICO score each month on your billing statement. Also be on the look out for the $150 sign up offer, which comes after spending just $750 in the first three months of membership. Or a $100 Amazon gift certificate after spending $500 in the same amount of time. These seem to come and go over time. The company also recently launched Discover it Miles, which offers unlimited 3% cash back during the first year, and 1.5% cash back thereafter. The Discover it card is a solid credit card. I love the free FICO score I get each month and the cash back categories are a nice supplement to my other credit cards. 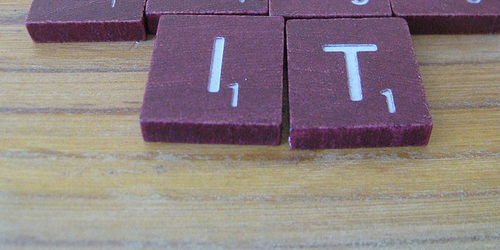 “It” is a good card, and one I carry as well – for the same reasons you’ve noted. The name is just kind of annoying, especially when telling people you have “it.” Very ambiguous. Can you use any credit card once logged in to the ShopDiscover portal for your purchase to get the cash back? I’ve had some issues with ShopDiscover. For whatever reason they don’t always credit my purchases with cash back, so take caution. Same thing happened to me and they told me to start a dispute or something. Lame! This is my go-to card when I’m not earning a sign-up bonus. Good cash back, 5%-20% cash back using the portal, and easy no fuss redemptions.